Halifax continued Featherstone’s Summer Bash jinx as they won 24-18 to move within a point of the Championship top four. 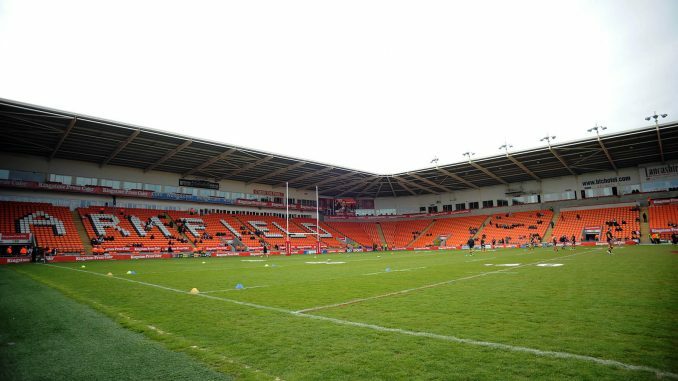 Late tries by Ben Johnston and Scott Murrell sent Featherstone to their fourth successive defeat at the annual event at Bloomfield Road, after John Duffy’s men had fought back from 14-0 down. Three second half tries inside nine minutes had turned the game in Rovers’ favour at 18-14 before their hearts were broken late on. Halifax opened the scoring on nine minutes when Scott Murrell, usually the one setting up tries himself, snatched Ben Kaye’s grubber kick as it bounced high by the posts to touch down. Murrell and his side were controlling the pattern of play and they were piggybacked downfield when Brad Knowles was penalised for dissent after a forward pass call went against Featherstone. From that field position, Steve Tyrer shrugged off a tackle attempt to score on the left hand side and he converted for 12-0. Featherstone were struggling to get any sort of foothold in the game and so disjointed was their performance that they would have been relieved to only go in 14-0 down at half time, after Tyrer had tagged on a penalty following a questionable high tackle call against Anthony Thackeray. There was a fiery start to the second half after a scuffle resulted in one player from each team – Dan Fleming and Mitch Clark – being sent for 10 minutes in the sinbin. Both players were back on the field by the time Featherstone would turn the game completely around in a blistering seven minute spell. First Gareth Hock drove at the line from close range and managed to turn in the tackle and get the ball down under pressure to get them on the board on 52 minutes. Then on a last tackle play, Thackeray attacked the line with purpose and managed to get over the line himself. Halifax were gifting their opponents field position with soft penalties, and off the back of one of them, Matty Wildie was able to dance his way around a couple of tacklers to put Featherstone in front. After Hock had avoided punishment for a high shot on Will Sharp, it looked like Halifax’s chances were gone when Tyrer was sinbinned 13 minutes from time for a trip on Keal Carlile. From the next set, Hock hit the line once again and thought he had scored a try, only for the video referee to judge he had lost the ball while stretching to put it down. That let off kept Halifax alive and no fewer than five players were involved in setting up the gamebreaking try, offloads by Murrell and Sharp eventually finding Quentin Laulu-Togagae, who pierced the right hand Featherstone defence with an arching run and then passed inside to find Ben Johnston to touch down. Shane Grady converted to put 12-man Halifax 20-18 to the good. After Tyrer returned to the field and give Halifax a full complement of players, they would put icing on the cake through a scruffy try from Murrell, whose kick bobbled through off a defender and back off himself before he dived on the ball over the line to spark jubliant scenes in front of the Halifax fans. Halifax: Laulu-Togagae, Saltonstall, Barber, Tyrer, Sharp, Murrell, Johnston, Fairbank, Kaye, Tangata, Grady, Butler, Grix. Subs: Moore, Morris, Fleming, Maher. Featherstone: Hardman, Briscoe, Hardcastle, Newman, Robinson, Holmes, Thackeray, Wheeldon, Carlile, Knowles, Lockwood, Davies, Moore. Subs: Wildie, Hock, Brooks, Clark.